Vice President Mike Pence, seen here in October, told diplomats at the State Department on Wednesday that "the caliphate has crumbled, and ISIS has been defeated." 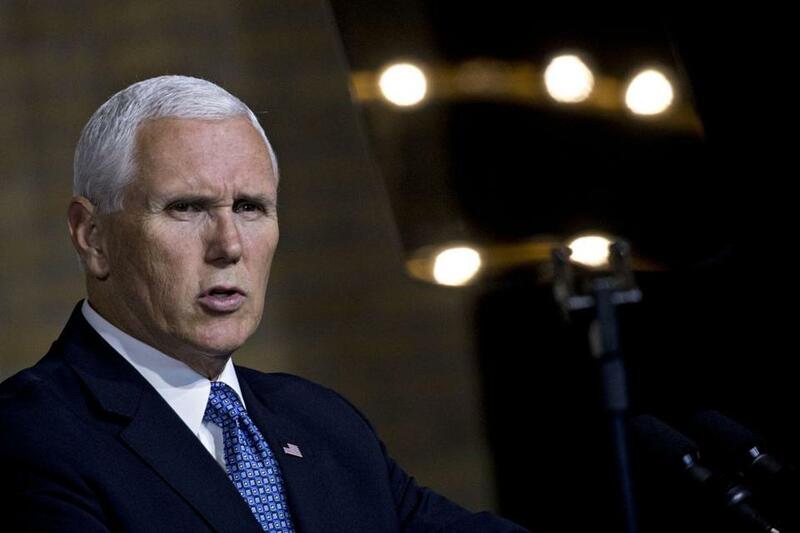 WASHINGTON — Vice President Mike Pence told US diplomats Wednesday that the Islamic State caliphate has collapsed in Syria, but he made no mention of the US military personnel confirmed killed in the country shortly before he spoke. In remarks filled with praise for the leadership of President Trump, Pence told the Global Chiefs of Mission conference at the State Department that some of the most heinous enemies of the United States are in retreat. Last month, Trump also claimed the military group has been defeated, leading him to announce the withdrawal of about 2,000 US troops there, though the timeline has wavered. Other administration officials have acknowledged Islamic State fighters remain active in a small area of the country. At about the same time as Pence arrived on the stage in an auditorium at the State Department to military marching music, his press secretary tweeted that Pence had been notified of the troops’ deaths earlier Wednesday. The Islamic State claimed credit for the suicide bombing that took their lives. ‘‘@VP has been briefed on the situation in Syria. He and @POTUS are monitoring the situation. Our hearts go out to the loved ones of the fallen,’’ tweeted Alyssa Farah. Hours later, the vice president’s office issued a statement acknowledging the American fatalities and expressing sympathy to the service members’ families. ‘‘President Trump and I condemn the terrorist attack in Syria that claimed American lives and our hearts are with the loved ones of the fallen. We honor their memory and we will never forget their service and sacrifice,’’ it says. Pence has a son, Michael, who is an officer in the Marine Corps. News of the American fatalities prompted a far different response from Republicans on Capitol Hill. Sen. Lindsey Graham, R-S.C., said Wednesday that the troop withdrawal announced by Trump has emboldened the militant group. Graham compared Syria to Iraq, and said the United States needs to maintain its commitment to forces fighting the Islamic State and its ideology, which cannot be as easily wiped out. In the House Foreign Affairs Committee, Rep. Michael McCaul, R-Texas, urged Trump to reverse the decision to pull troops from Syria. ‘‘Today’s deadly bombing targeting our troops in Syria is a reminder that ISIS still has the capacity to carry out attacks,’’ he said. Pence, following several rounds of applause, said the fight against militants in Syria remains a priority for the administration. The annual conference brought together 184 ambassadors and chiefs of mission from embassies and consulates around the world to discuss foreign policy issues the envoys are expected to raise. The travel money was spent before the partial government shutdown began, and was decided to go ahead with it, said a State Department official, said the conference went ahead because it is considered ‘‘essential to the conduct of foreign affairs essential to national security. During Pence’s speech, State Department employees who helped organize the conference but are not receiving pay during the almost four-week-old shutdown stood lining the steps alongside the wall. Pence did not mention the shutdown.